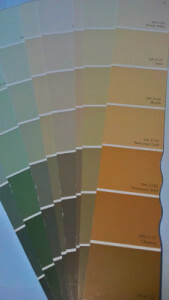 CHIPPING AWAY AT PAINT CHIPS - Decor Designs, Inc.
With a rainbow of hues and related tints at your fingertips (and in the space to be painted), it’s far easier to narrow down choices. Fan decks come in a variety of different shapes and sizes. Some are specialized (designer palettes etc…) while others contain the full spectrum from a particular manufacturer. Since I continue to run into people who don’t understand the basics of color selection, I thought it might be helpful to review a traditional fan deck. Understanding it will make color selection both simple and foolproof. So let’s take a look at this photo of a typical color strip. If you look at each strip, you see that the intensity or saturation of the color/hue increases toward the bottom of the each strip. “Value” is another term that describes how light or dark a specific color may be. In general, color strips are arranged with lighter values at the top, mid-tone values in the middle and darker tones at the bottom. The first value at the top is generally the “off-white” version of a color while the one at the bottom is the most saturated or “true” color on that strip. While they may look different in certain lighting, they are ALL the SAME color, just varying in saturation. With each successive step, and by adding 100% more pigment to the base (usually “white”) paint, as you go down the strip the various tints are achieved. Combining colors from the same color strip is a fault-free and easy way to accentuate architectural elements in a space without introducing an entirely new color. Logical starting and stopping points along the walls give you an opportunity to create visual interest with variations of only one color. When in doubt, it’s best to chose from the mid-tone values from any strip for walls (vertical surfaces). And go slightly lighter on floors and ceilings (horizontal surfaces) since the same colors in these areas will always appear darker then they do on your samples. TIP: If you decide to use more than one value on a strip (especially in adjoining spaces), it’s a good idea to skip at least one on the strip so your color transition looks purposeful and doesn’t simply appear as shadow. As simple as it may seem, taking the time to understand a Professional fan deck can help take a lot of the guesswork out of picking your paint colors. This entry was posted in Color, Decor Designs, Inc. and tagged Decorating Tips on February 28, 2014 by Jeff Rice.